Where Does Blue Nile Go From Here? Today, Blue Nile announced that its acquisition by Bain Capital Private Equity and Bow Street LLC has been completed. Going forward, it will no longer be a public company. Blue Nile, I have long thought, needs to act more like a traditional jewelry store. The company has long fashioned itself the un-jeweler, but that’s not really the case—it built its business on low-priced engagement rings. Many jewelers do that. But those stores supplement those sales with fashion jewelry and other branded items (including watches, which I’ll get to). I stopped by a Kay Jewelers last weekend, and I was struck by how just about every item in the cases had some kind of brand attached to it, proprietary or otherwise. You see that in many leading independents as well. There’s a simple reason for that—branded items, if sold correctly, command a greater margin. “Generic” diamonds are easily comparison shopped—and e-tailers are as vulnerable to this practice as any other business. It’s no wonder Blue Nile, which sells mostly nonbranded product, has low margins and a tough time turning profits. Having torched jeweler’s margins, Blue Nile is now trapped in the burning house it helped set aflame. To truly grow, the new Blue Nile needs to be more than just an order taker for men looking for cheap generic rocks. It should offer product that actually excites consumers and then lures them into the market. It was venturing in that direction with its Colin Cowie, Monique Lhuillier, and Zac Posen lines. It’s also come up with some cute promotional ideas, like its Dream Box. But those worthy initiatives seemed to recede into the background—at least judging from the airtime they received on company earnings calls—in favor of the brick-and-mortar webrooms. The webrooms are a good idea, but they basically back up the cheap engagement ring business model. And the company needs to do more. Take watches. That is clearly a growth sector for jewelry on the internet. It is tailor-made for Blue Nile, which has always had a heavy male following. Yet, we see watches sold on Jomashop. We see watches sold on Hodinkee, which isn’t technically an e-tailer. But we don’t see them on Blue Nile. Or take lab-grown diamonds, which seem well-suited for the Blue Nile audience: They are tech-y, and they (sometimes) let buyers save money. But that business has been mostly ceded to Brilliant Earth. Or charms. Just about every jeweler today carries some kind of low-end line. They generate substantial repeat business. But we don’t see them on the leading jewelry e-tailer. Finally, Blue Nile needs to promote itself. Its marketing has long been based on search. That’s like a jewelry store relying on a good spot in the mall. That may have worked in the past, but not anymore. Retailers need to get their name out, and that includes e-tailers. 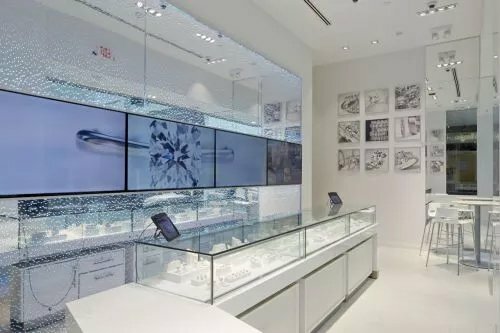 When consumers think jewelry, they think Kay, Zales, Tiffany, their local jeweler, and a million other brands besides Blue Nile. I don’t know whether all this played into Bain Capital’s acquisition of Blue Nile—which, given its $500 million price tag, has mystified many industry sources. Some observers, though, believe the brand is looking to expand internationally. But there is still much work to be done in the United States. Some readers won’t like me offering advice to Blue Nile, which they have long seen as “the enemy.” But I would argue that the way Blue Nile has long done business—based solely on price—has hurt the industry. That means it has ultimately hurt Blue Nile as well, since it is part of this industry, whether it admits it or not. Its future success may depend on how much it embraces that fact.